Follow the crystal clear instructions and helpful tricks to get you through the rough spots! Solve those tricky puzzles. Figure out where youâ€™re supposed to go next. Get tips and hints from the handy walkthrough. 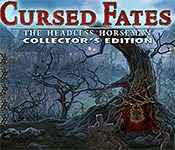 Sign-up to get informed when the Cursed Fates series has new game released with BD Studio Games' FREE bi-weekly newsletter.